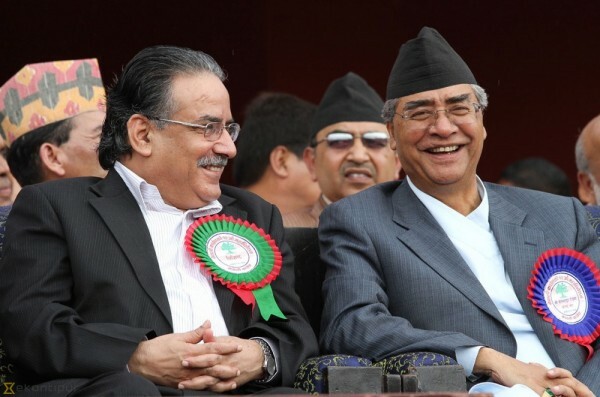 NC, CPN (MC) agree to hold local bodies election within mid-April - Integration Through Media ....! KATHMANDU: A meeting of the Nepali Congress and CPN (Maoist Centre) has decided to move ahead for holding local bodies elections within mid-April, 2018 after settling issues related to delineation of provinces. NC senior leader Ram Chandra Poudel told the National News Agency (RSS) that the meeting of the two parties held at Singha Durbar took the decision in this regard. Present in the meeting were NC President Sher Bahadur Deuba, senior leader Poudel and leaders Prakashman Singh and Bimalendra Nidhi, and Chairman Pushpa Kamal Dahal, Vice-Chairman Narayankaji Shrestha, General Secretary Krishna Bahadur Mahara, and other leaders from CPN (Maoist Centre). NC Chief Secretary Krishna Prasad Poudel said that the NC, which held discussion among office-bearers, former office-bearers and senior leaders regarding local bodies restructuring on Tuesday, would also give continuity to the discussion today.